My God, I offer You this Rosary for Your glory, so I may honor the Mother of Jesus, the Blessed Virgin, so I can share and meditate upon her suffering and, through her, the suffering of Jesus. I humbly beg You to give me true repentance for all my sins, wisdom, and humility. ---Act of Contrition: O my God, I am heartily sorry for having offended You, and I detest all my sins because I dread the loss of Heaven and the pains of hell; but most of all because they offend You, my God, You Who are all good and deserving of all my love. I firmly resolve, with the help of Your grace, to confess my sins, to do penance, and to amend my life. Amen. ---Then pray 3 Hail Marys: In compassion for our Sorrowful Mother's tears and to offer our tears in union with hers. ---Before Each Mystery, Pray: Most Merciful Mother, remind us always about the Sorrows of your Son, Jesus. ﻿"And when the time came for their purification according to the law of Moses, they brought Him up to Jerusalem to present Him to the Lord (as it is written in the law of the Lord, "Every male that opens the womb shall be called holy to the Lord"). 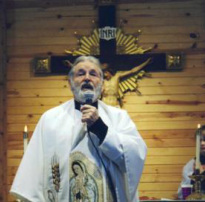 There, the old priest ﻿Simeon ﻿held the baby Jesus in his hands, and the Holy Spirit filled his heart. Simeon recognized Jesus as the promised Savior and held the Child high toward heaven, thanking God for granting his wish that he would live long enough to behold the Messiah. Prayer: Beloved Mother Mary, whose Heart suffered beyond bearing because of us, teach us to suffer with you and with love, and to accept all the suffering God deems it necessary to send our way. Let us suffer, and may our suffering be known to God only, like yours and that of Jesus. Do not let us show our suffering to the world, so it will matter more and be used to atone for the sins of the world. You, Mother, who suffered with the Savior of the world, we offer you our suffering, and the suffering of the world, because we are your children. Join those sorrows to your own and to those of the Lord Jesus Christ, then offer them to God the Father. You are a Mother greater than all. Mary’s Heart broke and her mind was greatly troubled when Joseph revealed to her the words of the angel: they were to wake up quickly and flee to Egypt because Herod wanted to kill Jesus. 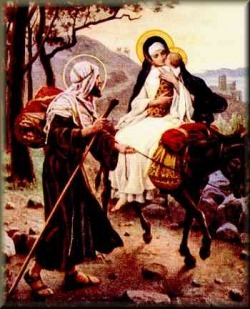 The Blessed Virgin hardly had time to decide what to take or leave behind; she took her Child and left everything else, rushing outside before Joseph so that they could hurry as God wished. Then she said, "Even though God has power over everything, He wants us to flee with Jesus, His Son. God will show us the way, and we shall arrive without being caught by the enemy." Prayer: Beloved Mother, who has suffered so much, give to us your courageous heart. Please pray for us to have strength so that we can be brave like you and accept with love the suffering God sends our way. Help us to also accept all the suffering we inflict upon ourselves and the suffering inflicted upon us by others. Heavenly Mother, you, in union with Jesus, purify our suffering so that we may give glory to God and save our souls. 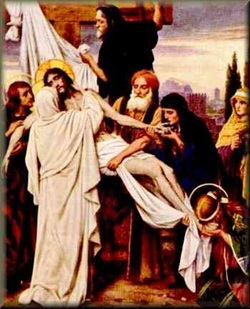 The Blessed Virgin Mary felt pain beyond bearing when Jesus was stretched out on the Cross. His murderers sang merrily as they approached Him with hammers and nails. They sat on Him heavily so that He could not move when they spiked Him to the wood. As they hammered the nails through His hands and feet, Mary felt the blows in her heart; the nails pierced her flesh as they tore into her Son’s body. She felt her life fading away. As the soldiers lifted the Cross to drop it into the hole they had dug, they deliberately jerked it, causing the force of His body weight to tear through the flesh and expose His bone. The pain shot through His body like liquid fire. Jesus endured three excruciating hours skewered on the Cross, yet the physical pain was nothing compared to the agonizing heartache He was forced to bear seeing His mother suffering below Him. Mercifully, He finally died. 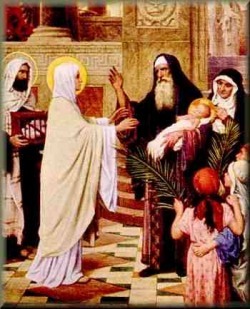 The friends of Jesus, Joseph and Nicodemus, took down His Body from the Cross and placed It in the outstretched arms of the Blessed Virgin. Then Mary washed It with deep respect and love because she was His mother. She knew better than anyone else that He was God incarnate who had taken a human body to become the Savior of all people. Mary could see the terrifying wounds from the flogging Jesus had received while at Pilate’s. His flesh had been shredded and large strips had been torn from His back. His entire body had been so lacerated that gaping wounds crisscrossed Him from head to toe. 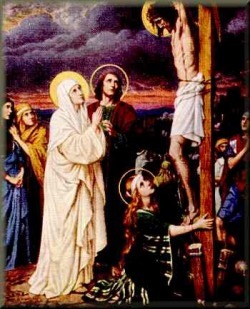 Mary found that the wounds from the nails were less severe than those caused by the flogging and by carrying the Cross. 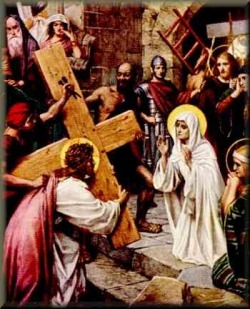 She was horrified at the thought that her Son had managed to carry the heavy, splintered Cross all the way to Calvary. She saw the circle of blood the Crown of Thorns had made on His forehead and, to her horror, realized that many of the barbed thorns had dug so deeply into His skull they had penetrated His brain. Looking at her broken Boy, the Holy Mother knew that His agonizing death was far worse than the torture reserved for the wickedest of criminals. As she cleaned His damaged Body she envisioned Him during each stage of His short life, remembering her first look at His beautiful newborn face as they lay in the manger, and every day in between, until this heart rending moment as she gently bathed His lifeless Body. Her anguish was relentless as she prepared her Son and Lord for burial, but she remained brave and strong, becoming the true Queen of Martyrs. As she washed her Son she prayed that everybody would know the riches of Paradise and enter the Gates of Heaven. 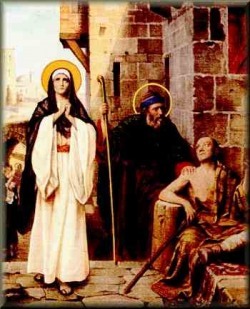 She prayed for every soul in the world to embrace God’s Love, so her Son’s torturous death would benefit all humankind and not have been in vain. Mary prayed for the world; she prayed for all of us. The life of the Blessed Virgin Mary was so closely linked to that of Jesus she thought there was no reason for her to go on living any longer. Her only comfort was that His death had ended His unspeakable suffering. 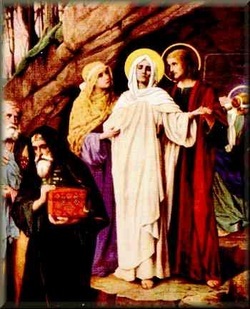 Our Sorrowful Mother, with the help of John and the Holy women, devoutly placed the Body in the sepulcher, and she left Him. She went home with great pain and tremendous Sorrow; for the first time she was without Him, and her loneliness was a new and bitter source of pain. Her heart had been dying since her Son’s heart had stopped beating, but she was certain that our Savior would soon be resurrected. You yourself were conceived and born without sin, were preserved from sin, yet you suffered more than anybody else . You accepted suffering and pain with love and with unsurpassed courage. You stood by your Son from the time He was arrested until He died. You suffered along with Him, felt His every pain and torment. You accomplished the Will of God the Father; and according to His will, you have become our Mother. We beg you, dear Mother, to teach us to do as Jesus did. Teach us to accept our cross courageously. We trust you, most Merciful Mother, so teach us to sacrifice for all the sinners in the world. Help us to follow in your Son’s footsteps, and even to be willing to lay down our lives for others. Concluding Prayer: Queen of Martyrs, your heart suffered so much. I beg you, by the merits of the tears you shed in these terrible and sorrowful times, to obtain for me and all the sinners of the world the grace of complete sincerity and repentance. Amen. Three times, say: Mary, who was conceived without sin and who suffered for us, pray for us.